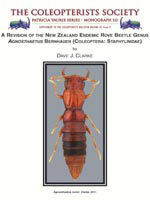 A Revision of the New Zealand Endemic Rove Beetle Genus Agnosthaetus (Coleoptera: Staphylinidae), by Dave J. Clarke. 118pp. The New Zealand endemic rove beetle genus Agnosthaetus Bernhauer, 1939 is revised. Thirty-four species are recognized and the following 28 new species are described: Agnosthaetus chiasma Clarke, Agnosthaetus rodmani Clarke, Agnosthaetus falx Clarke, Agnosthaetus stenomastax Clarke, Agnosthaetus heteromastax Clarke, Agnosthaetus tumidus Clarke, Agnosthaetus aequalis Clarke, Agnosthaetus akatarawa Clarke, Agnosthaetus zonatus Clarke, Agnosthaetus bicolor Clarke, Agnosthaetus impressus Clarke, Agnosthaetus nitidus Clarke, Agnosthaetus leviceps Clarke, Agnosthaetus ecarinatus Clarke, Agnosthaetus imitator Clarke, Agnosthaetus aorangi Clarke, Agnosthaetus orongo Clarke, Agnosthaetus minutus Clarke, Agnosthaetus lanceolatus Clarke, Agnosthaetus kaikoura Clarke, Agnosthaetus thayerae Clarke, Agnosthaetus newtoni Clarke, Agnosthaetus truncatus Clarke, Agnosthaetus sculptus Clarke, Agnosthaetus nunni Clarke, Agnosthaetus carnelius Clarke, Agnosthaetus enigmus Clarke, and Agnosthaetus affinis Clarke. Agnosthaetus brounides Newton, new name, is proposed as a replacement name for the type species Agnosthaetus brouni Bernhauer (junior secondary homonym), in light of T. Broun’s apparently valid description of Agnosthaetus brouni (Broun), new combination. Lectotypes are designated for Agnosthaetus cariniceps Bernhauer and A. brouni (Broun). Detailed and revised diagnoses and descriptions of both adults and presumed third instars are provided, including the first comprehensive larval description for the subfamily Euaesthetinae. According to the current suprageneric classification, Agnosthaetus is placed in the tribe Stenaesthetini based on the 5-5-4 tarsal formula and an immarginate abdomen. The monophyly of the genus is yet to be tested, but all known species share the following apparently unique characters: 1) distinctly ovate or crescentic dorsal tentorial sulci; 2) glandular pit on adoral surface of labrum; 3) sclerotized labial spines; 4) posteriorly directed corporotentorial arms; 5) mesocoxal internal apophysis; and 6) a dorsal branch arising from the metendosternal arms. The species are comparatively rarely collected, but may be found in a broad range of habitats, mostly forest leaf litter, where they are most efficiently collected by sifting.